Airing My Laundry, One Post At A Time...: National Donut Day Hosted By Entenmann's! National Donut Day Hosted By Entenmann's! I almost always have a box in the house. A lot of times, they are from Entenmann’s. Entenmann’s, if you didn’t know, makes a variety of delicious products. From muffins, to cakes, and yes, my favorite, donuts. This is why I was thrilled when someone from Entenmann’s contacted me. Did you know there is a National Donut Day? But there is! And it’s held on June 3rd. Entenmann’s has partnered with The Salvation Army to celebrate. 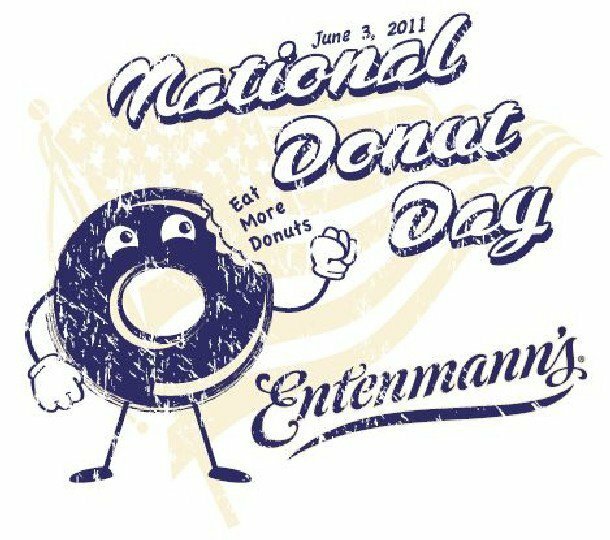 On June 3rd, Entenmann’s is going to honor the Salvation Army volunteers who served donuts in WWI. Did you know the Salvation Army is credited with popularizing the donut? I didn’t! I think it’s fabulous. Thank you, Salvation Army. 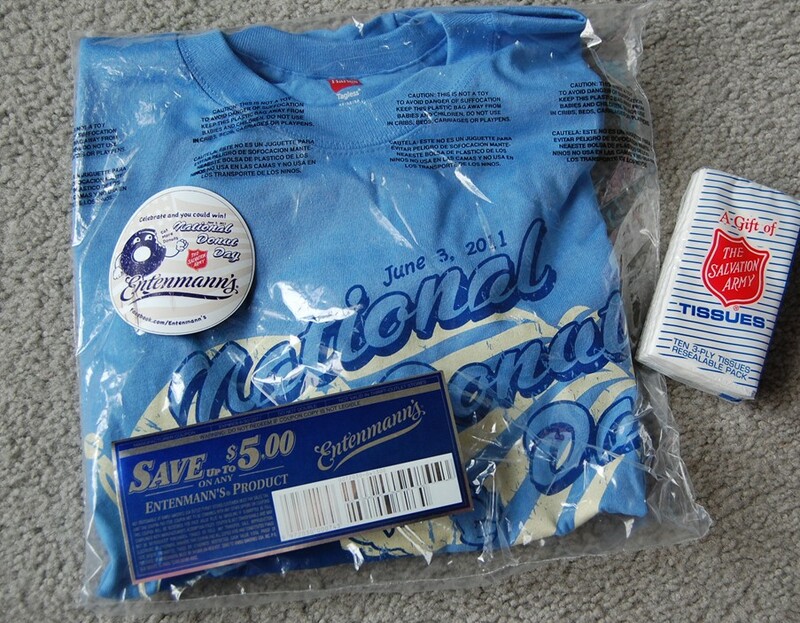 It consists of a t-shirt, a magnet, a coupon good for $5.00 off an Entemann’s product, and a package of tissues. Mandatory entry: Like Entenmann’s Facebook page. For every like they receive, they donate $1 to the Salvation Army. Even if you don't want to enter the contest, you could still like the company for this wonderful cause. They also have a sweepstakes going on over there. You can enter to win an iPad here! The sweepstakes is going on until June 15th. I’ll announce the winner on May 26th in the evening using random.org. I had no idea there was a National Donut Day. I LOVE donuts but rarely buy them because they call my name from their little box in the kitchen until I have eaten every last one of them! I "liked" Entenmann's on fb. I liked their page because donuts are delicious! And the Salvation Army does good work. And at the beginning of your post I was seriously afraid I missed "National Donut Day" and that would have been tragic! I liked their page. And now I'm in SERIOUS need of donuts. So glad to see I didn't miss National Donut day (didn't even know it existed!). I "liked" Entenmann's and love that they're working with the Salvation Army on this. ..and I liked Entenmann's on FB! I love Entenmanns! There's even an entire store filled entirely with Entenmanns products right around the corner from my office, I can hear a raspberry danish calling my name as I type. Now I'm going to have to go like them on Facebook so I don't miss donut day. oh i LOVE donuts too! Love Entenmann's - 'specially the crumbly coffee cake. Not sold much out west. I 'liked' them, so put me in! mmmmmmmmmmm donuts!!! I "liked" them. I LOVE doughnuts. My weakness. I "liked" them too . . . I could just die for a dozen Shipley's donuts right now!!! Every day is doughnut day for me, every day. My problem is that I eat a whole box at once. Don't judge. I'm in, baby! Yummmy!!!! I could sit and eat an entire box..all by myself. The donut holes are amazing!!!! I liked them! And entered the sweepstakes too. My father loves their apple strudels, only he can't ever find them anymore. I love that there is a notional doughnut day, must remember the day. Entenmann's is one of the only non-bakery items in the store I lurve. Liked 'em and entered to finally get my iPad. They've already reached their goal of $10k. Great stuff for the SA. Who wouldn't love Entenmanns once they had even a nibble. We'll be celebrating donut day!!! And I TOTALLY want that shirt, lol! Plus this is a great cause. Count me in!